This maincrop has a lot going for it! 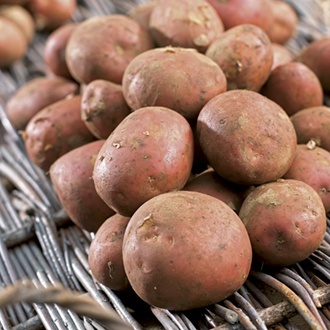 What makes Setanta different is it has excellent blight resistance and large yields of similar sized potatoes. Not only is it easy to grow but it’s a great versatile variety in the kitchen too! This red skinned variety has been bred from the famous Rooster variety. It has a dry, fluffy texture making it ideal for mash, roasts and chips and with deliciously crispy skins and a buttery taste, Setanta will make the perfect baker too! This superb all rounder has a reputation for being drought tolerant and also has good scab and slug resistance. It stores well so can be enjoyed for many months after harvest.